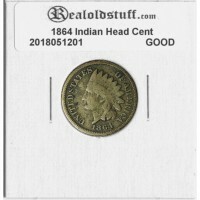 This is a very nice example of the 1864 Copper Nickel Indian Cent in Good condition. An even brown in color both obverse and reverse and problem free. This will be an admirable addition to any Indian Cent collection. The Indian Head cent, also known as an Indian Head penny, was produced by the United States Mint from 1859 to 1909. It was designed by James Barton Longacre, the Chief Engraver at the Philadelphia Mint. Originally minted on a thicker Planchet of Copper/Nickel composition, during 1864 the composition was changed to bronze and the planchet became thinner.